IFF in /downloads and CMX/CFP files in SKINS! Custom animated brand new item optimized and made for kids but adults can use it also, just won't look as good. Color boats, cats, flowers, stars, farm animals, silos, smiley faces and more. Tidy up and you earn money towards college. 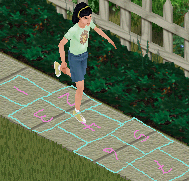 Tested perfectly in plain The Sims with no expansion packs! View the README file to install correctly! and telling me I couldn't use it to create brand new object animations... made me want to do it even more! Custom animated brand new object for kids use only. Cloned from chess table so as you're sitting doing your nails or getting a manicure, the number of polish bottles changes or you can "enchant" the bottles and they'll appear and disappear rapidly. Buffs untouched and requires Makin' Magic. One tile 4-rotation completer object for the gymnastics set... about a decade later, but hey - better late than never, right! Looks great next to apparatus used in your gym locations or sports venues. order to dismount. It's a donation gift. Custom-animated so that adults can do a little routine. No expansion packs required! 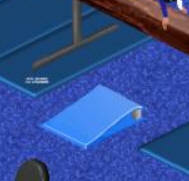 Click here to see entire gym. it and it's been voted to go ahead, so hope you enjoy it. No expansion packs required! 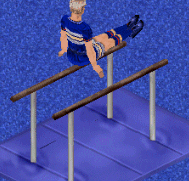 One, two or three sims can bounce at once on this trampoline. On two of the slots they will look more centered, and on one they'll look a little off this cut down on the number of files. All 3 can get on at once including children and/or adults. This is a decoration only (rug and dial) Don't clone this (don't know why anyone would want to) please and thank you! See FAQ for further info. I made an enhanced version of this to thank my donators which you can see below. same time, they must have clear access on all sides! Wind chimes that actually make a pretty wind chime sound when you view them! PLUS your simmies enjoy it, and so will you! Clone ok with link & readme file. This one has very special install instructions, so be sure to read them. but with different animations assigned to it. Ring is only visible in 2 rotations. 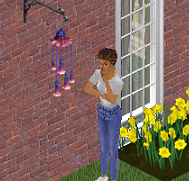 Custom-animated so that pets can jump up and have a look outside at the birdies. So cute! UL is required for the pets! BirdyChairs do NOT require SS even tho it's an SS design. The Matching people chair however, does require SS at this time. View the README file to install custom animated objects correctly!